With the way things are going, the republicans might have only Donald trump, Sarly Fiorina, Ben Carson and Jeb Bush as the last people standing for election under Lincoln's party because they have enough brass to sponsor themselves. Republican Governor Scott Walker of Wisconsin abruptly pulled out of the 2016 U.S. presidential race on Monday, doomed by a lightning-quick collapse from serious contender to also-ran candidate struggling to raise money. 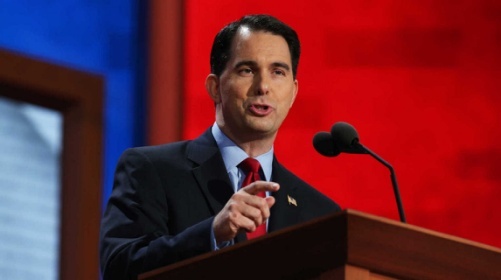 Walker's departure left his rivals seeking the Republican nomination for the November 2016 presidential election scrambling to appeal to his supporters in the early-voting states of Iowa and New Hampshire as well as elsewhere. Experts saw potential gain for conservative candidates like Ted Cruz and Mike Huckabee as well as center-right contenders such as Marco Rubio, John Kasich and Jeb Bush. For Walker, a shaky performance on the campaign trail plus two lackluster performances at Republican debates spooked financial donors. His staff disagreed about how the 47-year-old Walker could regain the star status he held after electrifying conservatives in Iowa in January. Walker's departure reflected the difficulty faced by the 15-candidate field in attracting enough financial support from a limited pool of donors. Other low-polling Republicans may well pull out in the weeks ahead.